Declining returns on music games prompts savage staff cuts at Activision studios. Almost everyone has had dreams of being a rock star, but as of yesterday, you shouldn't rely on a videogame to help you fulfill them. Not a videogame from Activision anyway, as it announced last night that it was halting work on the 2011 Guitar Hero release, and disbanding the division at its publishing arm that handled the franchise. According to Activision, the Guitar Hero franchise had stopped being profitable, and so the decision was made to bring it to an end. It's no secret that the most recent release, Guitar Hero: Warriors of Rock, received a lukewarm response from critics and consumers alike. Warriors of Rock was really just the latest example of a genre in decline however, a far cry from its heyday in the early days of the Guitar Hero franchise. 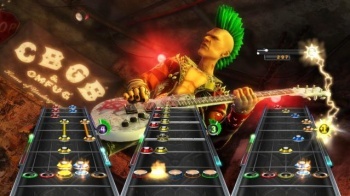 Besides the Guitar Hero cancellation, there are also rumors of layoffs at Vicarious Visions, which made the Wii version of Warriors of Rock, and FreeStyleGames, which made DJ Hero. Activision has not commented directly on these rumors, but an SEC filing revealed that it is cutting a staggering five hundred staff. These cuts are said to be in "anticipation of a continuing weak environment for casual and music-based games." Activision predicts that these layoffs will cost it between $35 and $50 million in severance pay and other costs. While the end of Guitar Hero has been coming for a while - thanks, in no small part, to Activision shoving so many of them out of the door - it's hard not to see this as the end of an era. Our thoughts go out to everyone affected by the job cuts, and we hope they're able to find something else soon.